© Bhat et al. ; Licensee Bentham Open. Dengue fever is considered the most important arthropod-borne viral diseases in terms of morbidity and mortality. An accurate and efficient diagnosis of dengue plays an important role in case confirmation. The virus may be isolated during the viremic phase (within day 5 of illness), from serum, plasma and peripheral blood mononuclear cells. Enzyme linked immunoassay (ELISA) has demonstrated the presence of high levels of dengue NS1 antigen and tests may be performed by enzyme-immunoassays (EIAs) or immune-chromatographic (ICT) methods. These assays are specific with respect to different flaviviruses. Conventional and real time RT PCR, nested PCR, multiplex PCR and Nucleic acid sequence based amplification (NASBA) have been described as sensitive and relatively rapid method of detecting the virus during the early viremic phase. Other tests used include assay of anti-dengue specific IgM and IgG ELISA. Currently no curative treatment in terms of anti-viral drugs is available for dengue and patients are managed with rest and aggressive supportive therapy. Management may be done at home or in the hospital depending on the severity of the illness. Hospital management includes fluid therapy, blood component transfusion and other modalities of treatments like steroids, recombinant factor VII and management of complications. Various vaccines are in trial stages and may become available in the near future. Keywords: Arthropod-borne viral diseases, dengue, diagnosis, infection, management. In terms of morbidity as well as mortality, dengue fever may be regarded as the most important arthropod-born viral disease. As per the estimates of the World Health Organization (WHO) approximately 50 million cases of dengue infection are detected every year worldwide . Various factors like demographic as well as societal changes may contribute to dengue infections. Population growth and unplanned urbanization has led to the creation of large crowded human populations residing in substandard living conditions. They have inadequate water, sewage and waste management systems along with defective mosquito control measures. There is also migration of individuals from endemic to non-endemic areas. In addition to these factors, in many developing and non-developed countries the public health spending is insufficient in terms of both finance and resources leading to emergence and spread of dengue. The dengue causing flavivirus belongs to the family Flaviviridae and is a single stranded RNA virus with four serotypes (Dengue 1, 2, 3 & 4). Clinically a patient of dengue generally presents with fever and headache. In addition there could be other accompanying symptoms such as maculopapular or petechial rash, myalgia, arthralgia, and sometimes retro orbital pain. The intensity of these clinical manifestations varies depending on the severity of the disease. The disease may be asymptomatic or present as severe shock with haemorrhage and thrombocytopenia and may even cause death. Apart from these symptoms, several body organs may get affected . It includes hepatomegaly, systolic and diastolic cardiac impairments, acute renal failure as well as multiple organ failure. Ocular impairments may be seen as subconjunctival, intraretinal, macular or vitreous hemorrhage. Other less common complications include acute pancreatitis and damage to vascular endothelium. The common neurological complications include encephalitis and encephalopathy. Rarely viral invasion of the spinal cord may cause myelitis. Other less common complications include myositis, rhabdomyolysis, and myocarditis and hypokalemic paralysis . It is imperative that accurate and speedy diagnosis of the infection is delivered so that it can be differentiated from other diseases including rubella, leptospirosis as well as other flavivirus infections [4, 5].It is required for the surveillance as well as clinical management of the disease. Currently no specific antivirals or vaccines are available for treatment of dengue. Only symptomatic and supportive case management is possible which relies upon an early and accurate diagnosis. For instituting proper control measures at the public health and individual level specific diagnosis of the disease is also important. Again, diagnosis is crucial for conducting research to determine the epidemiological factors which may influence the pathogenesis of the disease as also the characteristics of the virus, vector, host pathogen interactions, and in vaccine research. (Phase 1—3 studies) [6, 7]. The laboratory diagnosis of dengue can be performed by a variety of assays for the detection of dengue virus specific IgM, IgG antibodies, non-structural 1 (NS1) antigen based detection and the reverse transcriptase-polymerase chain reaction (RT-PCR). Antibody detection can be achieved using various assays which include complement fixation, neutralization, hemagglutination inhibition (HI), (IgM) capture enzyme-linked immunosorbent (MAC-ELISA), and IgG ELISA assays [8, 9]. Although the gold standard for laboratory diagnosis of acute dengue virus infection is considered to be isolation and characterization of the virus, however, there are many drawbacks in this procedure. Virus isolation is expensive and it also requires six to ten days to replicate in tissue culture cells. Hence it cannot be recommended for clinical diagnosis & case management. The most commonly used method is enzyme immunoassay (ELISA as it is cost-effective, less time consuming and more sensitive. Serological IgG cross reaction in flaviviruses has been documented, however, cross reactivity for IgM antibodies is still poorly understood. These cross-reactive antibodies (e.g. Japanese encephalitis and dengue flaviviruses) may confound during serological tests, including ELISA, and also complicate epidemiological assessment of relative disease burden in co-endemic areas [10-12]. The virus may be isolated during the viremic phase (within day 5 of illness), from serum, plasma as well as mononuclear cells in the peripheral blood. Cell lines from mosquitoes particularly C6/36 (Ae. albopictus), AP- 61 (Ae. pseudoscutellaris) and other mammalian cell culture lines such as vero, LLC-MK2 and BHK -21 have been used for virus isolation [15, 16]. These are then detected by immunofluorescence usually in 1-2 weeks. Virus isolation is generally not useful in clinical diagnosis and management because of limitations in terms of availability and high cost. NS1 (Non-structural protein) is a 40-46KDa highly conserved glycoprotein of the dengue virus, which may play a role in virus replication . Enzyme linked immunoassay (ELISA) has established that high levels of dengue NS1 antigen and up to 10ng/ml of soluble hexameric NS1 are observed to be present in the serum of dengue infected patients . NS1 tests may be performed by enzyme immunoassays (EIAs) or immunochromatographic (ICT) methods and the assays are specific with respect to different flaviviruses. One large meta analysis showed that the summarized sensitivity and specificity for single EIA based NS1 tests was 67% and 99% respectively and for ICT based NS1 tests it was 71% and 99% respectively . Their inability to detect the infection in samples collected in late phase of dengue is one of the major limitations of NS1 detection technique. This can be attributed to the low amount of NS1 antigen and the specific antibody present in the serum. Therefore, NS1 must be interpreted with caution in patients with ≥ 5 days of illness or in secondary dengue . Conventional and real time RT- PCR, nested PCR, multiplex PCR and Nucleic acid sequence based amplification (NASBA) have been described as sensitive and relatively rapid method of detecting the virus during the early viremic phase [8, 21]. Real time (RT) and Nested RT PCR assays afford greater sensitivity and lesser time for detection of dengue infection as compared to conventional PCR assays . Many PCRs use a mix of four serotype-specific oligonucleotide primers with different genomic locations (E, NS1, E/NS1, prM/E, NS5, NS5/3’) . These assays are of varying complexity and performance characteristics. The CDC DENV-1-4 uses validated oligonucleotide primers and dual labelled hydrolysis (Taqman) probes for detecting dengue serotypes 1, 2, 3 & 4 and is approved by the US-FDA . Real time RT- PCR assay Reverse transcriptase-polymerase chain reaction (RT-PCR) generally gives a definitive diagnosis of dengue within the first five days of infection. The sensitivity of various PCR assays in different studies has ranged from 25% to 100% [21, 25]. The NASBA assay in which the extracted RNA is amplified in a single step isothermal reaction without thermocycling and the product is detected by electrochemoluminescence has been shown to be highly sensitive and specific for dengue infection . However, it is not widely available in most hospital based diagnostic laboratories as it is an expensive method. Assay of anti-dengue specific IgM is dependent on the immune response of the infected person and the time taken to produce IgM antibodies against dengue virus antigens. In most cases it is only on days 4-5 of illness that the first detectable IgM appears (Fig. 1). IgM antibodies are detectable in 80% of dengue cases by day five of illness, and in 99% by the tenth day of illness, which may then remain detectable for over three months . The test utilizes anti-human IgM antibodies to capture IgM antibodies in patient’s serum which are then reacted with dengue specific antigens. A single serological test report detecting the presence of IgM may only indicate a recent dengue virus infection. A paired second serum sample testing is required to confirm the diagnosis of acute infection. It cannot differentiate different serotypes of dengue . All the flaviviruses share antigenic epitopes, which may result in cross-reacting antibodies amongst them . The IgM levels are very low in the early phase of the infection (0-3 days), therefore the IgM ELISA cannot be used to detect infection during this period. This is one of the major limitations of the test. Hence, tests like RT-PCR, NS1 antigen detection is essential for diagnosis of acute infection. Studies have shown that NS1 and IgM combination detected dengue in 95.9% whereas PCR and IgM/IgG capture ELISA in combination had sensitivity above 90% and up to 99% through the course of illness [20, 28]. The IgG ELISA which uses the same antigens as the MAC ELISA can detect past dengue infection and also can be used to differentiate between primary and secondary dengue . Seroconversion to a positive IgG or a 4 –fold rise in IgG titres in the convalescent phase sample as compared to the acute phase sample (with a 7 day gap) are suggestive of primary dengue and secondary dengue infection respectively . Although dengue virus infection produces life-long protective immunity to the infecting serotype, protection against the other serotypes is limited  and subsequent infection with a different serotype may occur. 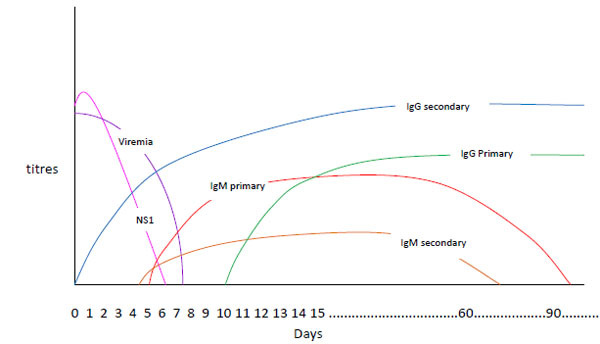 A primary dengue infection is characterized by a slow IgM antibody rise appearing by days 3-5 (Fig. 1)and IgG detectable by seven days of illness . In secondary dengue, IgM titers rise slower than IgG titers and at times may result in false-negative RESULTS. In contrast, to this levels of IgG tend to rise faster and may become detectable during the early stages of infection. There may be cross reactivity with other flaviviruses and IgG levels may persist for years. To differentiate between primary and secondary dengue IgM/IgG ratios may be used, but these are not well standardized and may vary between laboratories . Currently no curative treatment in terms of anti-viral drugs is available for treatment of dengue. Majority of these cases can be managed with rest and aggressive supportive therapy without hospitalization. That makes it important to diagnose the infection and make the supportive care available to patients as soon as possible. The treatment can be divided into home management & hospital based management. Hospital based management includes fluid therapy, blood component transfusion, supportive therapy and management of complications. Well hydrated patients, can be managed at home after baseline investigation. These may be defined as patients who are tolerating oral fluids, can pass urine every six hours and do not demonstrate any symptoms of shock or hemorrhage. Base line investigations include complete blood count, especially thrombocyte count and packed cell volume, and tests to assess liver function. Majority (44-73%) of patients come under such category and require no hospitalization .Most of these patients can be managed with antipyretic drugs like paracetamol, tepid sponging and adequate rest plus oral hydration with water, milk, juice, soup, etc. Daily weight and urine output monitoring if possible will help in maintaining fluid balance. Antiplatelet drugs like aspirin, mefenemic acid and ibuprofen should be avoided as thrombocytopenia is a serious complication of the disease. Daily paracetamol intake should not exceed more than 4 gm per day in adults and accordingly in children. However patients developing warning signs of dengue like mucosal bleeding, epistaxis, gum bleeding, purpuric rash on skin, hematemesis, malaena, abdominal pain, persistent vomiting, sleepiness, thirst, cold clammy skin may require immediate hospitalization. In addition to above mentioned warning signs, other criteria like spontaneous bleeding, organ impairment characterized by hepatomegaly, chest pain, respiratory distress and cyanosis will require immediate hospitalization. Other impairments like rising hematocrit secondary to plasma loss and hemoconcentration, ascites, pleural effusion as well as other co-morbid conditions like pregnancy, diabetes mellitus, and hypertension are also candidates for hospitalization . Reference hematocrit should be obtained before starting with the fluid therapy, which may include isotonic solutions like Ringer’s Lactate or 0.9 % saline. It may be started with 5–7 ml/kg/hr for 1–2 hours, then may be reduced to 3–5 ml/kg/hr for 2–4 hr, and then further reduced to 2–3 ml/kg/hr or less according to clinical response . The maximum limit for crystalloid infusion is 20 ml/kg/hr. If the patient’s condition worsens, crystalloid solution may be replaced with colloid solution such as dextran or plasma. As soon as improvement occurs, crystalloid solutions are restarted. The volume of fluid needed to treat is similar to that given to patients of diarrhea with mild to moderate isotonic dehydration. Continuous monitoring for fluid status is carried out guided by serial levels of hematocrits, monitoring of blood pressure, and urine output every few hours. In patients with de ngue, blood may be transfused on a prophylactic basis when there a risk of significant clinical bleeding. Generally patients with World Health Organization Grade 3 bleeding require prophylactic blood transfusion . However earlier therapeutic interventions can be considered in cases of haemorrhagic symptoms which may require higher transfusion thresholds. Major indication for blood transfusion is thrombocytopenic bleeding. Generally threshold platelet count of 10000/µl is taken for prophylactic platelet transfusion in asymptomatic patients . Higher transfusion thresholds have shown no significant benefits. On the contrary higher transfusion threshold has caused increased chances of pulmonary edema and greater duration of hospital stay in patients with dengue shock syndrome . In bleeding patients higher threshold of 50000/µl is taken for therapeutic platelet transfusion . However correlation of platelet count with bleeding manifestation has been found to be variable in different studies with some studies showing positive correlation  and others no correlation . Similarly in patients of pediatric age group platelet count has little correlation with bleeding manifestation or disease severity . Other predictors for spontaneous bleeding include fever, rash, vomiting and leucopenia . In such cases, beside platelets the patient may require packed red blood cells (PRBC) transfusion. Unlike prophylactic platelet transfusion there is no well defined trigger for therapeutic PRBC transfusion and it is mainly based on clinical judgement for early recognition of hemorrhagic and/or shock symptoms. The duration of shock may be an additional risk factor for hemorrhage and may require early intervention in the form of intravenous fluids to restore circulatory homeostasis . Deranged coagulation profile can be another complication of dengue which may require therapeutic intervention in the form of fresh frozen plasma transfusion . Recombinant factor VII may be useful in cases of DHF with massive life threatening bleeding . Transfusion related risks especially with platelets like febrile non hemolytic transfusion reactions, allergic reactions, bacterial sepsis, transfusion related acute lung injury, alloimmunization, platelet refractoriness, transfusion associated graft versus host disease and transfusion transmitted infections (TTI) may pose additional challenges. Hence any transfusion will require judicious decision making based on sound scientific evidence where benefits outweigh risks. In addition, the use of specialized procedures like leukodepletion and gamma irradiation of platelets and PRBC, TTI screening of blood by more sensitive nucleic acid testing (NAT) based methods and mandatory implementation of bacterial screening of platelets may ameliorate some of these risks. Recombinant factor VII may be useful in cases of severe dengue with massive life threatening bleeding . Corticosteroids, intravenous immunoglobulin, anti-D immune globulin etc. have been used in cases of dengue with no tangible benefits . Management of complications remains mainly a supportive treatment in an ICU setting. Episodes of seizures are treated with antiepileptic and for myositis steroids are given. Other complication like hypokalemic paralysis may be corrected with supplements of potassium whereas for myocarditis ionotropic drugs will be helpful . Dengue infection during pregnancy may present with symptoms similar to pre-ecclampsia and care must be taken to differentiate between the two. The management essentially remains symptomatic with maintenance of hydration, rest and antipyretic medication. If the mother contracts infection during the peripartum period, risk of transmitting it to fetus increases. The blood samples of the new born may be analyzed for low platelet counts and liver function tests. In developing countries since dengue epidemic outbreak is quite common, it causes massive burden on blood inventory management. Due to shorter shelf life of five days availability of platelets become a major limiting factor. Secondly due to lack of any specific guidelines many incidence of inappropriate transfusion happens which may further complicate the transfusion support . Sometimes outbreak of strains causing haemorrhage may lead to higher use of platelet and fresh frozen plasma due to associated complications. Providing safe blood after specialized procedures like leukodepletion and gamma irradiation, institution of more sensitive NAT for TTI screening and additional bacterial screening of platelets may prove too costly and time consuming for effective implementation especially during emergency situations. Hence there is need to develop evidence based guidelines to manage such cases. Prevention of the disease always remains a public health priority. It includes protection from mosquito bites using various mosquito repellents and most importantly identifying and eliminating breeding sites of the mosquitoes. Public awareness initiatives play a major role in this endeavour. Vaccination remains another potent preventive measure. However, the dengue vaccine is still in the process of development. It would require protection against all four serotypes of the virus. Targeted mutagenesis based live attenuated vaccine, cell culture passage based live attenuated vaccine, chimeric dengue vaccines, inactivated dengue vaccine, dengue subunit vaccine and virus vectored vaccines are in various trial phases and it is hoped that the dengue vaccine would soon be available to the public for immunization . Chawla P, Yadav A, Chawla V. Clinical implications and treatment of dengue. Asian Pac J Trop Med 2014; 7(3): 169-78. Verma R, Sahu R, Holla V. Neurological manifestations of dengue infection: a review. J Neurol Sci 2014; 346(1-2): 26-34. Guzmán MG, Kourí G. Advances in dengue diagnosis. Clin Diagn Lab Immunol 1996; 3(6): 621-7. Cordeiro MT. Laboratory diagnosis for dengue. Rev Inst Med Trop Sao Paulo 2012; 54(18)(Suppl. 18): S10-2. Vaughn DW, Green S, Kalayanarooj S, et al. Dengue viremia titer, antibody response pattern, and virus serotype correlate with disease severity. J Infect Dis 2000; 181(1): 2-9. Guzman MG, Rodriguez R, Rodriguez R, et al. Dengue 4 virus envelope glycoprotein expressed in Pichia pastoris induces neutralizing antibodies and provides partial protection from viral challenge in Macaca fascicularis. Am J Trop Med Hyg 2003; 69: 129-34. Shu PY, Huang JH. Current advances in dengue diagnosis. Clin Diagn Lab Immunol 2004; 11(4): 642-50. De Paula SO, Fonseca BA. Dengue: a review of the laboratory tests a clinician must know to achieve a correct diagnosis. Braz J Infect Dis 2004; 8(6): 390-8. Oceguera LF III, Patiris PJ, Chiles RE, Busch MP, Tobler LH, Hanson CV. Flavivirus serology by Western blot analysis. Am J Trop Med Hyg 2007; 77(1): 159-63. Kuno G. Serodiagnosis of flaviviral infections and vaccinations in humans. Adv Virus Res 2003; 61: 3-65. Makino Y, Tadano M, Saito M, et al. Studies on serological cross-reaction in sequential flavivirus infections. Microbiol Immunol 1994; 38(12): 951-5. Kalayanarooj S, Vaughn DW, Nimmannitya S, et al. Early clinical and laboratory indicators of acute dengue illness. J Infect Dis 1997; 176(2): 313-21. Race MW, Williams MC, Agostini CF. Dengue in the Caribbean: virus isolation in a mosquito (Aedes pseudoscutellaris) cell line. Trans R Soc Trop Med Hyg 1979; 73(1): 18-22. Philip Samuel P, Tyagi BK. Diagnostic methods for detection & isolation of dengue viruses from vector mosquitoes. Indian J Med Res 2006; 123(5): 615-28. Muller D, Young PR. The Many Faces of the Flavivirus Non-structural Glycoprotein NS1. In: Yong SP, Ed. Molecular Virology and Control of Flaviviruses. United Kingdom: Caister Academic Press 2012; pp. 51-75. Shenoy B, Menon A, Biradar S. Diagnostic utility of dengue NS1 antigen. Pediatr Infect Dis 2014; 6: 110-3. Zhang H, Li W, Wang J, et al. NS1-based tests with diagnostic utility for confirming dengue infection: a meta-analysis. Int J Infect Dis 2014; 26: 57-66. Huang CH, Kuo LL, Yang KD, et al. Laboratory diagnostics of dengue fever: an emphasis on the role of commercial dengue virus nonstructural protein 1 antigen rapid test. J Microbiol Immunol Infect 2013; 46(5): 358-65. Wright WF, Pritt BS. Update: The diagnosis and management of dengue virus infection in North America. Diagn Microbiol Infect Dis 2012; 73(3): 215-20. Guzmán MG, Kourí G. Dengue diagnosis, advances and challenges. Int J Infect Dis 2004; 8(2): 69-80. Yong YK, Thayan R, Chong HT, Tan CT, Sekaran SD. Rapid detection and serotyping of dengue virus by multiplex RT-PCR and real-time SYBR green RT-PCR. Singapore Med J 2007; 48(7): 662-8. Wu SJ, Lee EM, Putvatana R, et al. Detection of dengue viral RNA using a nucleic acid sequence-based amplification assay. J Clin Microbiol 2001; 39(8): 2794-8. Gowri Sankar S, Balaji T, Venkatasubramani K, et al. Dengue NS1 and prM antibodies increase the sensitivity of acute dengue diagnosis test and differentiate from Japanese encephalitis infection. J Immunol Methods 2014; 407: 116-9. Huhtamo E, Hasu E, Uzcátegui NY, et al. Early diagnosis of dengue in travelers: comparison of a novel real-time RT-PCR, NS1 antigen detection and serology. J Clin Virol 2010; 47(1): 49-53. Vázquez S, Cabezas S, Pérez AB, et al. Kinetics of antibodies in sera, saliva, and urine samples from adult patients with primary or secondary dengue 3 virus infections. Int J Infect Dis 2007; 11(3): 256-62. Falconar AK, de Plata E, Romero-Vivas CM. Altered enzyme-linked immunosorbent assay immunoglobulin M (IgM)/IgG optical density ratios can correctly classify all primary or secondary dengue virus infections 1 day after the onset of symptoms, when all of the viruses can be isolated. Clin Vaccine Immunol 2006; 13(9): 1044-51. Anderson KB, Chunsuttiwat S, Nisalak A, et al. Burden of symptomatic dengue infection in children at primary school in Thailand: a prospective study. Lancet 2007; 369(9571): 1452-9. Teo D, Ng LC, Lam S. Is dengue a threat to the blood supply? Transfus Med 2009; 19(2): 66-77. Guidelines for the use of platelet transfusions. Br J Haematol 2003; 122(1): 10-23. Lum LC, Abdel-Latif Mel-A, Goh AY, Chan PW, Lam SK. Preventive transfusion in Dengue shock syndrome-is it necessary? J Pediatr 2003; 143(5): 682-4. Chaudhary R, Khetan D, Sinha S, et al. Transfusion support to Dengue patients in a hospital based blood transfusion service in north India. Transfus Apheresis Sci 2006; 35(3): 239-44. Diaz-Quijano FA, Villar-Centeno LA, Martinez-Vega RA. Predictors of spontaneous bleeding in patients with acute febrile syndrome from a dengue endemic area. J Clin Virol 2010; 49(1): 11-5. Malavige GN, Velathanthiri VG, Wijewickrama ES, et al. Patterns of disease among adults hospitalized with dengue infections. QJM 2006; 99(5): 299-305. Lum LC, Goh AY, Chan PW, El-Amin AL, Lam SK. Risk factors for hemorrhage in severe dengue infections. J Pediatr 2002; 140(5): 629-31. Lai PC, Lee SS, Kao CH, et al. Characteristics of a dengue hemorrhagic fever outbreak in 2001 in Kaohsiung. J Microbiol Immunol Infect 2004; 37(5): 266-70. Chuansumrit A, Wangruangsatid S, Lektrakul Y, Chua MN, Zeta Capeding MR, Bech OM. Control of bleeding in children with Dengue hemorrhagic fever using recombinant activated factor VII: a randomized, double-blind, placebo-controlled study. Blood Coagul Fibrinolysis 2005; 16(8): 549-55. Fatal bacterial infections associated with platelet transfusions--United States, 2004. MMWR Morb Mortal Wkly Rep 2005; 54(7): 168-70.
 de Castro RA, de Castro JA, Barez MY, Frias MV, Dixit J, Genereux M. Thrombocytopenia associated with dengue hemorrhagic fever responds to intravenous administration of anti-D (Rh(0)-D) immune globulin. Am J Trop Med Hyg 2007; 76(4): 737-42. Ghosh A, Dar L. Dengue vaccines: challenges, development, current status and prospects. Indian J Med Microbiol 2015; 33(1): 3-15.